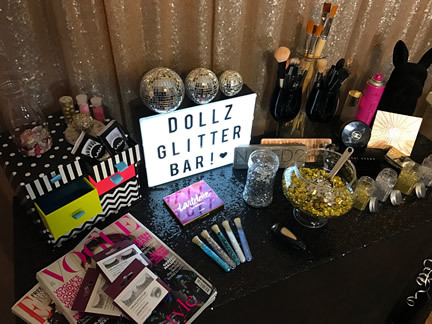 Dollz Glitter Bar is the must have pop-up stall to have at your event. Who doesn’t love sparkles!? The Dollz Glitter Bar is available to hire for your event. We include 2 Dollz team members (makeup and hair pro team) to offer glitter services for you and your guests. Every set up can be customised to suit your theme including the glitter mix and colours We can offer selfie stations with mirrors and backdrops to offer the ultimate party package. Dollz events like unique. 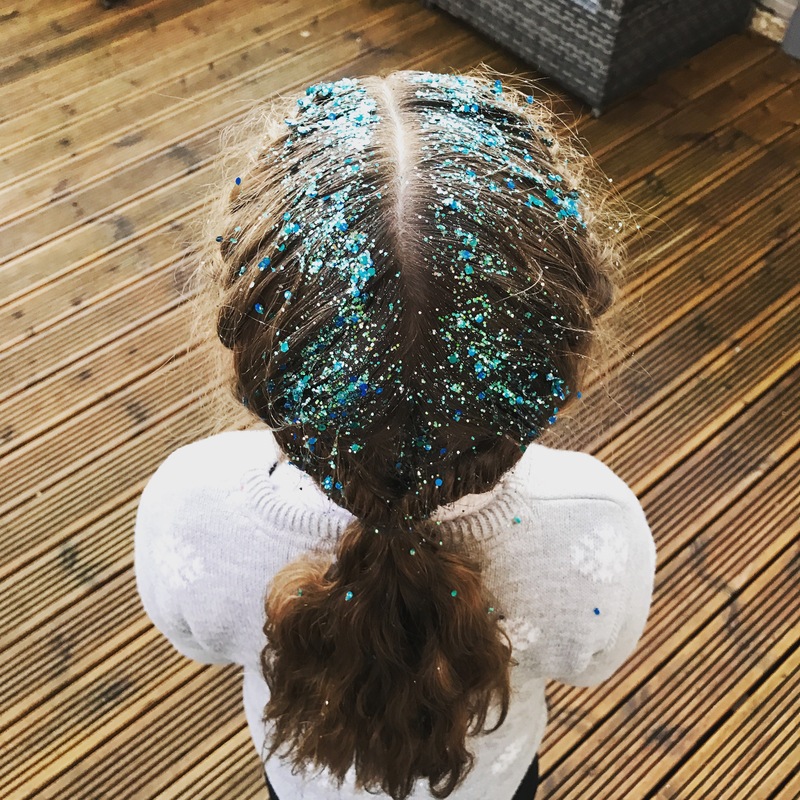 This is why we want to know everything about your event so we can spend some time creating the perfect glitter pop up for you. 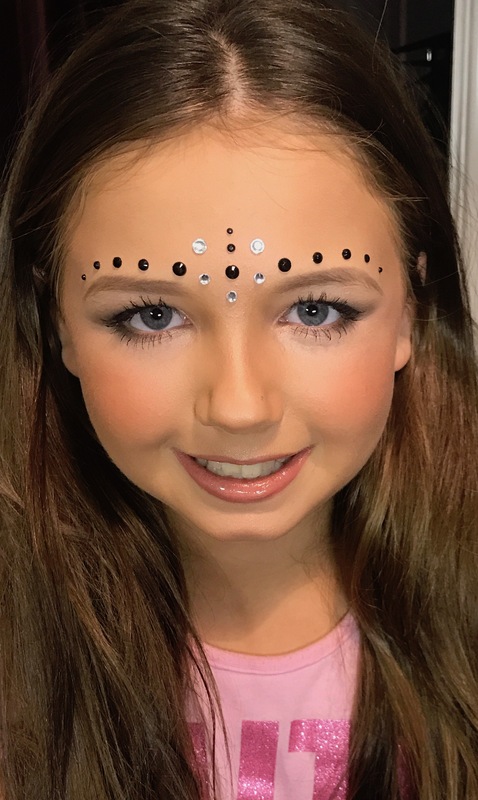 We can offer so much more too; eyelashes, custom mixes, selfie wall, letter lights, props and makeup and hair touch up services. We do it all! We can also customise our backdrop with quotes, letters and numbers to tie in with your party. What events can have a glitter bar? We recommend the Dollz Glitter Bar for any event. Weddings are a great idea! Once you’ve eaten, had the speeches and introduced the evening guests then the drinks start flowing and what a better way to get everyone in the party mood – Get the glitter out!! Baby showers can have their own glitter mixes custom made for each and every guest. We can come up with a set glitter look offering a backdrop for a gift table. Birthdays happen all the time so how can you set your party right up there in the party of all parties. GLITTER. Men and women alike, facial hair can be glittered too! Launch party for a new venue/product is a big deal and there’s usually a set theme throughout. Offering jewels and set coloured glitters will ensure the theme is met and everyone ties the bow on your event. What glitter do you use? 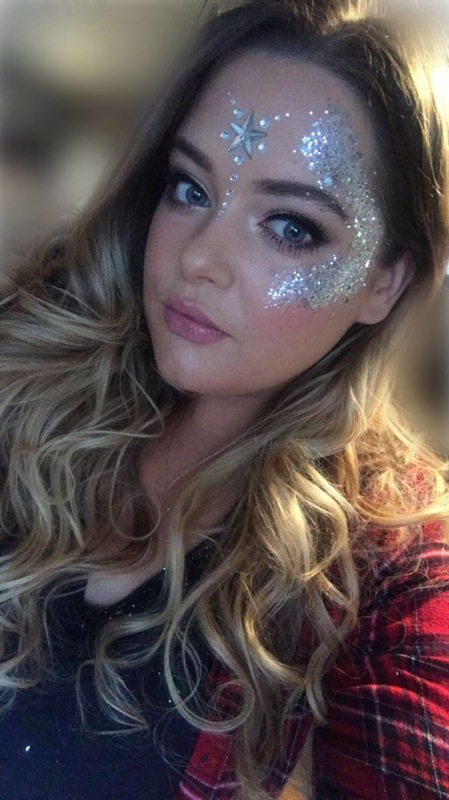 All glitter used at our bars is cosmetic grade glitter, we would never use anything else on the face. 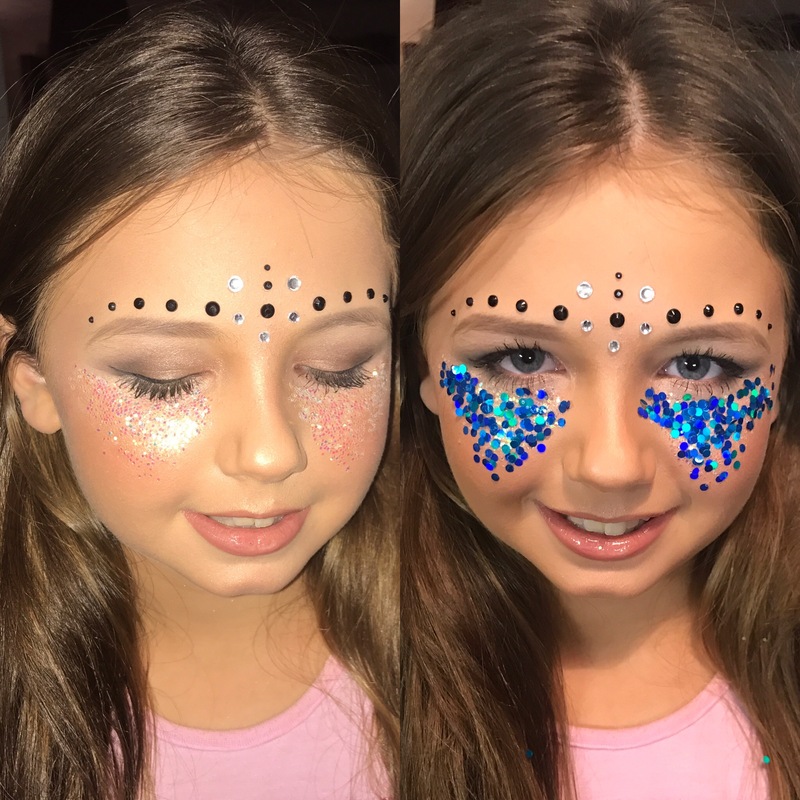 Glitters are sourced from a reputable company and they provide us with all our sparkle and glue needs. 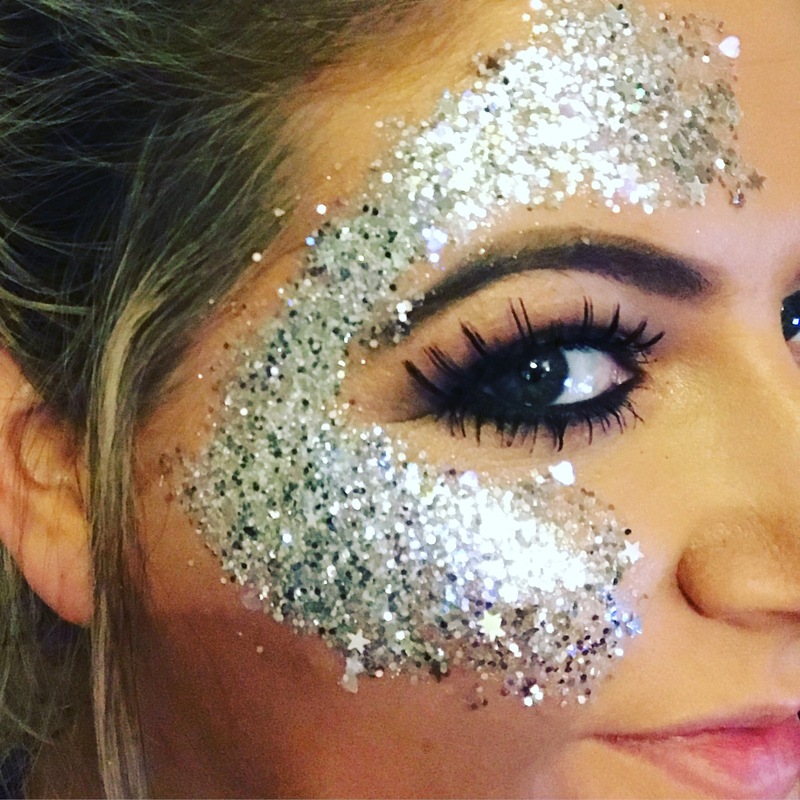 How much does it cost to hire the Dollz Glitter Bar? The Dollz Glitter Bar is £300.00 to hire. This includes the whole set up as well as 2 Dollz team members for all your glitter makeup and hair needs, glitters and glue. The pop-up glitter stall can be customised to meet your requirements. You may your own ideas or we can suggest any extras to add that special touch; letter lights, selfie stations with props and makeup & hair touch ups. Please get in touch with us on [email protected] for a bespoke quote.